Rhoda Carleton Coote and her beloved husband Major Henry Coote came to New Zealand in 1853. They lived in Canterbury, and then the Wairarapa, and Henry became a member of the Legislative Council (the Upper House of parliament). But as Henry slowly died from consumption (tuberculosis) they tried to find a better place for his health; first the Governor, Sir George Grey, kindly allowed them to live in the new Mansion House at Kawau Island, then they moved to Nelson. Finally, in 1867, when it appeared there was no hope, they came to live on Mulgrave Street in Wellington, across the street from St Paul’s, which then was less than a year old. Throughout her life Rhoda wrote a diary; in it she always calls her husband ‘my precious one’, or ‘my darling’. The couple moved in the very top echelons of Wellington society, being good friends with both Bishop Selwyn and Bishop Abraham, and many others connected to St Paul’s, who showed great kindness to them. In March 1867 Bishop Abraham arranged for the deathly ill man and his wife to attend church at St Paul’s; the couple sat together in the beautiful little octagonal vestry room to hear the service; ‘he was greatly cheered and comforted by being able to go’, Rhoda wrote in her diary. 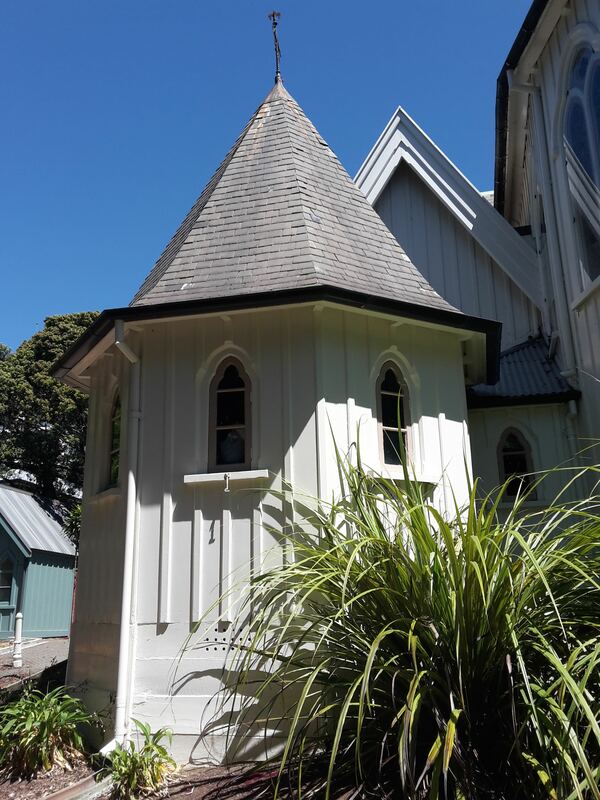 The wooden octagonal vestry room, with its stunning turret roof, such a feature of the church, is much the same as it was when they sat there together, even though it has been moved 5m to the east, when the church was made larger. My dear one was taken downstairs this evening and I have just seen him in his coffin and though outwardly calm and tearless, feel bowed down with grief too deep for tears. How shall I get through life without him? But God is a jealous God and will have no rival, hence he is taken from me. That all our hopes should end in this is dreadful indeed. It was a terrible ordeal, and I thought I should have to leave but I am glad I did not for it was beautiful and comforting sermon on death from the Bishop … shewing that death opened the gate to life eternal. Would I could feel more comfort in my dear one’s having entered that life. May God give it me. A few months later, Bishop Selwyn and his wife Sarah were leaving the country, so Rhoda arranged to travel with them back to the United Kingdom. In the intervening months she visited her husband’s grave frequently, and writes of having to say goodbye not only to her friends in New Zealand, but also of leaving her husband’s grave behind, which she would never see again. A memorial brass to Henry was placed in St Paul’s. Rhoda’s diary and memoirs have been published by her relation John Carleton Holmes; these and the original diaries are available at the Alexander Turnbull Library.